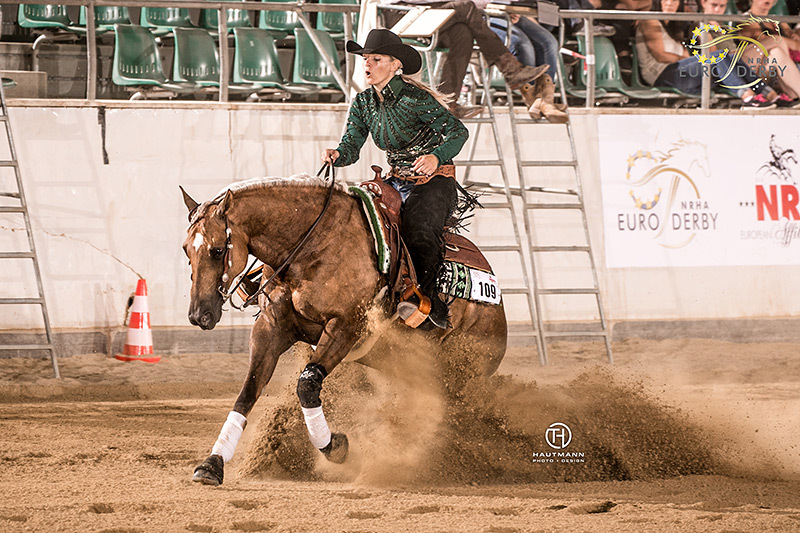 For Immediate Release – July 27, 2018 – Kreuth – An amazing group of non pro reiners lit up the stage in the National Reining Horse Association (NRHA) European Derby Non Pro finals in Kreuth, Germany. 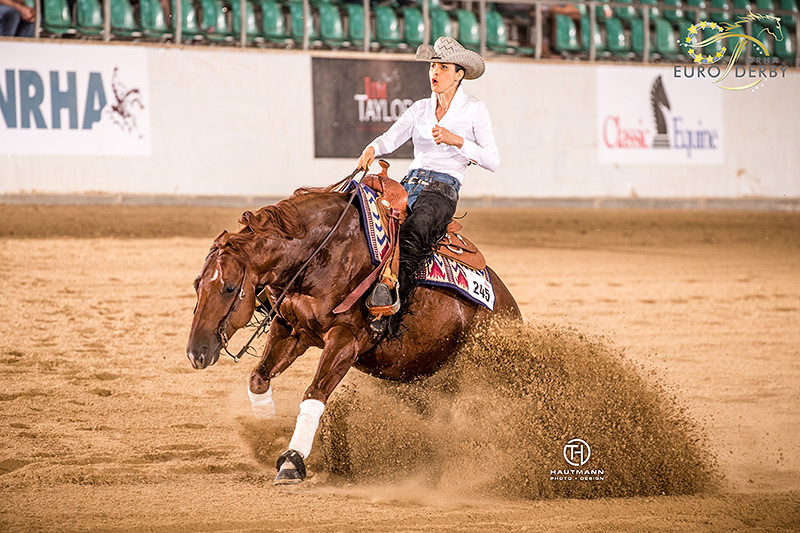 Last to draw were the $17,393-added* L3 and $9,939-added* L2 Non Pro Derby go-round leaders, Ulrike Krueger and her 6-year-old mare SL Shesgotmeparklin, an own daughter of NRHA Three Million Dollar Sire Jacs Electric Spark out of Shes Customized, bred and nominated by Sandra Linnig-Foehl. With a 224.5 to beat the pressure was on but the Austrian rider and her mount gave it all they had. They performed NRHA pattern #12 to a 221 score which earned them the L4 Non Pro Derby Reserve Championship as well as the L3 and L2 Championships. “It’s been an incredible week and it’s great to have been able to achieve this result with this mare who I’ve had ever since she was a 2-year-old. 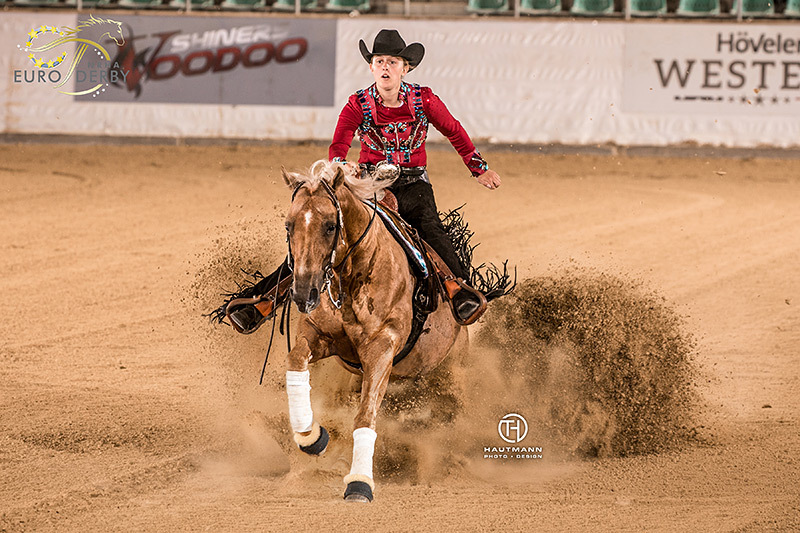 Being able to work her from the round pen to this incredible result is great,” said Krueger who was quick to credit her mentors NRHA Million Dollar Rider Bernard Fonck and his wife NRHA Professional Ann Fonck. With a 219.5 score, Italian Carlo Ambrosini riding MF Over The Rainbow (Shortys Buck A Roo x Jodies Nice Rainbow) took the reserve championship in the L3 division and claimed third place in the L4. The 5-year-old stallion is owned by his family breeding and training facility, Ambrosini Quarter Horses ASD, and was nominated by Moreno Furlan. Sharing the second step of the podium in the L2 division was Adrienne Spiedel of Switzerland riding her own Electric Mercedes. The 7-year-old mare by Jacs Electric Spark out of Best By Benz was bred and nominated by CDJ Performance Horses. Taking reserve honors in the L1 division with a 217.5 was Olga Hoffman of Germany riding her own Walla Whiz Keen. The 8-year-old gelding by NRHA Million Dollar Walla Walla Whiz out of Keen Little Katie is bred and nominated by her owner. The NRHA European Derby is open to 5-, 6-, 7- and 8-year-old horses nominated in the NRHA Nomination Program. Since 2009 foals have been required to nominate to the program to be eligible to enter NRHA European Derby and Futurity. The nominator receives 5% of the money earned by the nominated horse at the two events, even if the horse is sold. There has been overwhelming support of the NRHA Nomination Program since its inception. In 2017, the program’s eighth year, 1,589 weanlings were European-nominated, the most in the program’s history. The NRHA European Open Derby finals will close the eighth edition of the prestigious event on Saturday, July 28 following the NRHA European Affiliate Youth and Non Pro Championship classes. Make sure to follow the action live FREE on www.nrhaeuropeanderby.com!